Settlement seen from the Ucayali River in Peru. We motored down a muddy tributary of the Ucayali River in the Peruvian Amazon, traveling quickly to make it home before dark. We had travelled upriver the day before with eight monitors from Nuevo Saposoa and Patria Nueva, communities of Peru's indigenous Shipibo-Conibo people. Our mission: to investigate and document areas that satellites had identified as possible sites of recent deforestation. As we passed a deforested area along the river, a man called us over from shore. He was the leader of a group of “invasores,” a term the communities use for outsiders who migrate and settle within indigenous territories clearing forests and often planting coca, an activity that is illegal in the area. The man was wary of the community monitor activities and insisted on his right to the land. Teofilo Magipo, the President of Nuevo Saposoa, argued back: this deforestation was inside their territory boundaries. Teofilo showed the man our location, with satellite-based pixels showing the deforestation that had occurred in our exact location. “The satellites are watching you,” he warned. This is emblematic of battles being fought daily across remote corners of the Amazon – messy, in-person disputes over the control of land in areas with little government presence and law enforcement. Indigenous communities like Patria Nueva and Nuevo Saposoa are at the front lines. Satellite data and forest monitors help communities better understand threats to their territories, and give them a tool to defend their rights when interacting with outsiders and the authorities. The monitoring activities are part of a Rainforest Foundation US (RFUS) project to train indigenous communities in the use of cutting-edge forest monitoring technologies. The monitors follow up on weekly GLAD alerts from Global Forest Watch, which show the location of likely deforestation at a 30-meter resolution. 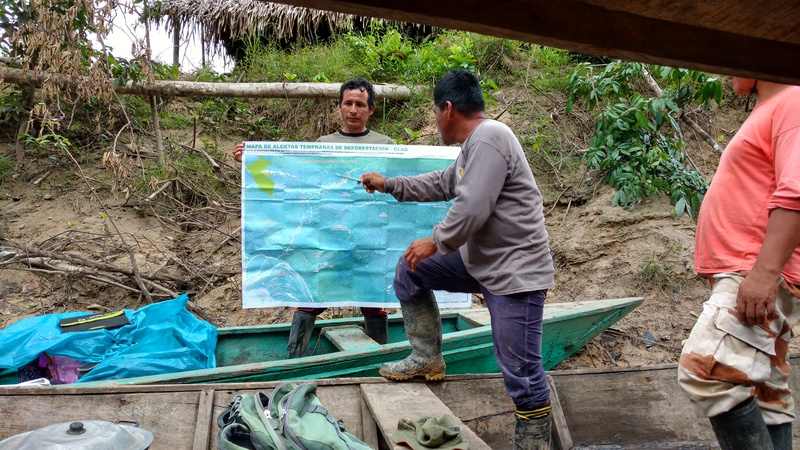 An internet connection is hard to come by in the field, so RFUS regularly supplies the community monitors with paper maps with the alerts from its regional base in Lima. As the information is delivered, community monitors use smartphone GPS to navigate themselves to the location of the alerts and take photos and video to document what they find. Sometimes they take additional footage with drones. Crucially, the paper maps also show official territory boundaries, so the monitors know exactly where their territory begins. As appropriate, they alert legal authorities. Based on data gathered in the monitoring activities, the two communities have made numerous legal complaints to the regional environmental prosecutors about violations to the Forest Law within their territories. While cases are ongoing, environmental prosecutors have made four visits to the communities to investigate. The monitoring was also crucial in catalyzing the recent titling of an expansion of the communities’ ancestral territories, a process that took nine years. Satellite data from Global Forest Watch helped verify the communities’ argument that the invasores had settled and deforested recently, refuting the invasores’ claim of arrival prior 2008, which was when the communities submitted the request for territory expansion. Local authorities are taking note recognizing the advanced skills of the community monitors and their role in defending vulnerable areas of forest near the Sierra del Divisor National Park. The monitors have been officially recognized as Forest Custodians by the Ucayali Regional Forest Service, a role which grants them authority to confront illegal activity, decommission of illegally obtained natural resources, and direct access to relevant authorities such as environmental prosecutors and the military. Indigenous communities around the world face deforestation and other threats to their territories (and research suggests that they are effective in stopping them). The knowledge GLAD alerts provide is integral to this struggle. “We now have information, and with this information, we can find the deforestation and control our territory,” says Teddy Cairuna-Cauper. Better monitoring technologies in remote areas will equip these communities to defend their land and protect their forests. Using Global Forest Watch, others can easily replicate the exceptional model laid out in Nuevo Saposoa and Patria Nueva. Weekly GLAD alerts are currently available for 16 countries, with more on the way. Additionally, Global Forest Watch is developing a mobile application called Forest Watcher, which will make it easier to access these alerts offline and collect information in the field. Nuevo Saposoa and Patria Nueva have embraced a cutting-edge monitoring system in their territories, and achieved greater control over their land in relatively short time. Our hope is that other communities across the world will be inspired by their work and do the same. Learn more about the weekly GLAD alerts, and sign up for updates on the upcoming Forest Watcher mobile application. Let us know your ideas for applying GFW tools to on-the-ground monitoring on the GFW Discussion Forum!